I had some leftover turkey from last Christmas in the freezer. 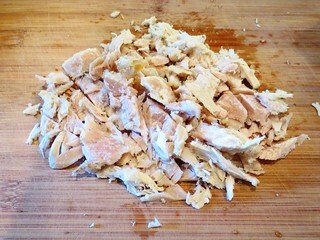 I cut it all up which resulted in over a cup of nice meat to add to my soup mix. 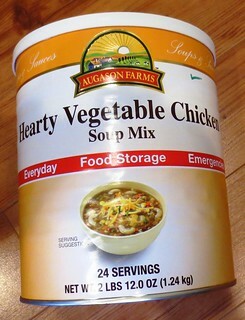 I used about 2 cups of Auguson hearty vegetable chicken soup mix along with 7 cups of water for my soup base. I then added salt, pepper and a few splashes of Worcestershire sauce all into my Crockpot. If you haven’t used Auguson storage foods before, let me just say they are good product at a value price. I have made this soup mix before and it is very tasty. 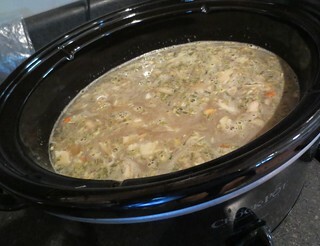 Here is a picture after everything was in the Crockpot. I started my Crockpot on high and left it for 2 hours and now have it simmering on low. Dinner in a few hours and I will post another photo as soon as it is done.